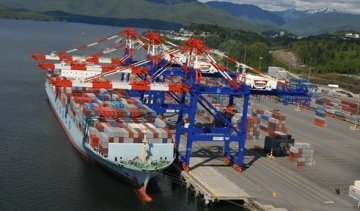 ﻿ VANCOUVER: Calling it a “commitment to limit air emissions from the Canadian transportation sector”, the federal government announced it will implement a Shore Power Technology for Ports program, beginning next year. Essentially the program will permit docked ships to connect to an on-shore electrical supply to power their systems, allowing captains and operators to avoid running the ships’ engines. In turn, this should cut down on fuel costs and reduce greenhouse gas emissions. The practice is also known as cold-ironing or marine shower power. The program is designed to provide up to $27.2 million in cost-shared contribution funding between April 1, 2013, and December 31, 2015. Before any money is distributed there will be a round of consultations with port authorities and terminal operators. Then a call for proposals will be issued. At that point port authorities and private companies that operate or own ports and terminals will be eligible to apply for funding. This program follows on the heels of a test program known as the Marine Shore Power Program which began in 2007 and ends in March 2012. It provided $2 million to the Port of Metro Vancouver to install shore power for cruise ships and $1.8 million to the Port of Prince Rupert to provide power to container ships. Captain Chris Hearn, director of the Centre for Marine Simulation at the Marine Institute in St John’s, says that while cruise ships will gain a bigger advantage from shore power, as they have to power their hotel operations even while in port, cargo ship operators should also benefit. Besides saving on the costs of fuel, Hearn said the shutting down the engines allows for maintenance to be performed on them. Still he said that as this is a fairly new technology that hasn’t been widely adopted yet, there still are some concerns that need to be addressed. He said solutions need to be put in place to ensure that ships using different electrical standards, ships from Europe or Asia, for example, have access to power that they can use—that the connectors are standardized and that there are transformers provided to convert the power. Still, he called this move by the government a “refreshing change leaning toward environmentally beneficial practices”.